Football frenzy in Toronto! 6 p.m. kickoff, Argooooos! 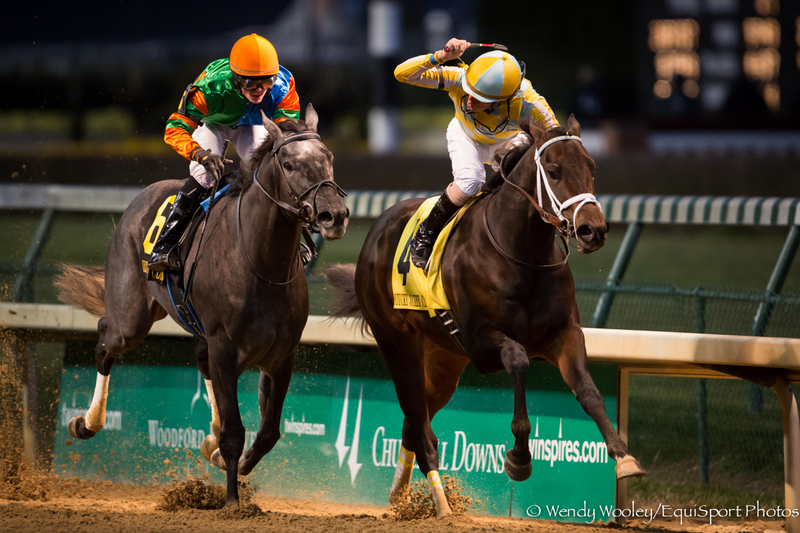 Canadian horse racing had some excitement yesterday as UNCAPTURED was not caught, he fought hard along the rail to win the Grade 2 Kentucky Jockey Club at Churchill, an important race on the way to the Kentucky Derby. The colt wrapped up champion 2-year-old honours in Canada at the Sovereign Awards (in April) with the win and he may even could sneak into the top 3 noms for Horse of the Year, an award that likely will go to multiple graded stakes winner HUNTERS BAY (2nd in Woodbine Mile also). UNCAPTURED’s gritty win came in 1:44 4/5, which was a 75 Beyer Figure, suggesting he still may be happier in races up to 1 mile. He is by Lion Heart out of Captivating, by Arch. Captivating is out of a Bold Ruckus mare. His Beyer matched that of SEANEEN GIRL, the 30 to 1 shot who won the Golden Rod on the same card. The Spring at Last filly was bought for just $5,000 by Robert Tiller and Rolph Davis, raced at Woodbine for $40K claiming before she was 3rd in Mazarine. She was then sold to her current interests. MAGIC BROOMSTICK may have won champion older mare honours with her 3rd win in her 3rd and final start of 2012. The More Than Ready mare, bought by Sam-Son Farms for $110,000 as a yearling, won the Brade 3 Bessarabian yesterday to complete her career. She won 2 sprint stakes and a route stake in her 3 races this year. She has won 8 of 16 races and $484,000. Mark Frostad trainer the mare until recently when Malcom Pierce took over the farm’s horses. Uncaptured stamped himself as an early favorite for the 139th running of the Kentucky Derby Presented by Yum! Brands (Grade I) after a outlasting a tenacious Frac Daddy in deep stretch to win Saturday’s 86th running of the $171,150 Kentucky Jockey Club (GII) at Churchill Downs by a neck. By clocking 1 1/16 miles in 1:44.97, Uncaptured, owned by John Oxley and trained by Mark Casse, became the seventh horse to sweep Churchill Downs’ fall juvenile stakes. The last horse to complete the Iroquois-Kentucky Jockey Club double was Tiz Wonderful in 2006. Winning jockey Miguel Mena completed a sweep of his own Saturday. Two races earlier, the 26-year-old native of Peru prevailed aboard longshot Seaneen Girl in the Grade II, $167,550 Golden Rod for 2-year-old fillies. Uncaptured was sent to post as the 9-5 favorite in the field of 13 two-year-olds fresh off his a 5 ½-length Iroquois romp on Oct. 28. Breaking from post 4, he tracked pacesetter Track Rocker, who clicked off fractions of :23.37 and :49.16 in the early stages of the two-turn race. Frac Daddy, the 5-2 second betting choice after an impressive 9 ¾-length maiden win on Nov. 3, rated just behind Uncaptured down the backstretch. With three furlongs to run, both Uncaptured and Frac Daddy made their moves for the lead. Frac Daddy, racing four-wide, poked his head in front but Uncaptured was a determined foe who fought on through a stiff drive and proved unyielding. Uncaptured paid $5.60, $3.20 and $2.60. Frac Daddy, ridden by David Cohen, returned $3.80 and $2.80. Dewey Square, under Corey Lanerie, was another 1 ¼ lengths back in third and paid $4. Uncaptured, bred in Ontario, Canada by William Graham, is a Lion Heart colt out of the Arch mare Captivating. Saturday’s triumph was his sixth trip to the winner’s circle in seven starts. His lone defeat was a fifth in the Grey (GIII) at Woodbine in early October. The $101,047 winner’s share of the purse increased his earnings to $510,837. Equally important were the 10 points he earned on the new “Road to the Kentucky Derby” series that awards points to the Top 4 finishers in a select group of 36 races. The Kentucky Jockey Club is part of the 19-race “Kentucky Derby Prep Season” which continues through mid-February. Uncaptured now ranks fifth on the list with 10 points behind Shanghai Bobby (20), Goldencents (14), Joha (10) and Overanalyze (10). Earnings in non-restricted stakes races will break all ties, and the Top 20 point earners nominated to the Triple Crown at the end of the series will earn a spot in the Kentucky Derby starting gate. Casse said Uncaptured may go to a farm in Ocala, Fla. before resuming training this winter at the Palm Meadows Training Center. “Mr. Oxley called me right before the race and said, ‘Mark, the rail is no good.’ So I said to Miguel, ‘Whatever you do, don’t get caught on the rail.’ Going into the first turn, Miguel did a nice little move because he was going to be stuck on the rail. He backed off and let that horse go and was able to get on the outside of him, but then got pinned down on the rail. He got cut up a little bit and (Miguel) said he got bounced around pretty good. “Honestly, at the eighth pole I thought he was beat. Very seldom does a 2-year-old get headed, be on the inside and come back and win. He showed his gameness today. Good horses can win, when things don’t go perfect. Q. Will Miguel Mena keep the mount? “That’s a good question. That’s a question Mr. Oxley and I are going to have to talk over during the winter time. We also have Patrick Husbands, who has been our go-to guy forever and it’s not Patrick’s fault he’s not here. We had other things for him to do on Iroquois day. I don’t know. I’d say it’s 50-50. It’s going to be Patrick Husbands or Miguel.